President Recep Tayyip Erdoğan, right, and Belarusian President Alexander Lukashenko shakes hands before their talks in Ankara, April 16, 2019. Turkey and Belarus have devised a new vision for bilateral ties to capitalize on further economic cooperation, revising the bilateral trade volume to $1.5 billion. President Recep Tayyip Erdoğan and Belarusian President Alexander Lukashenko agreed to expand cooperation areas into defense, agriculture, technology, transportation and tourism and oversaw the signing of six agreements yesterday during the Belarusian president's visit to Ankara yesterday. "The agreements we have signed today constitute the contractual commitment of our rapport," President Erdoğan said at the joint press conference at the Presidential Complex. During President Erdoğan's visit to the country in 2016, the bilateral trade target was set at $1 billion. "We have not reached our target yet, but today we have revised our bilateral trade target up to $1.5 billion. Turkey and Belarus have the potential to achieve that goal," Erdoğan said, citing the growing trade. The two sides established a working group to reach $1.5 billion in trade volume, which has been growing gradually since 2016. Turkey's exports to Belarus rose 4.2 percent year-on-year to stand at $439 million while its imports from Belarus increased 5.6 percent to $193 million in 2018. President Erdoğan also emphasized that the two governments support and encourage Turkish and Belarusian businesspeople for mutual investments. As a concrete example of that support, Erdoğan said, a joint investment of Azerbaijan and Belarus has been recently inaugurated in the central Anatolian province of Kırıkkale. A tractor factory, with an investment cost of $5 million, began operations last week and the first tractors will be manufactured by the end of this month. Drawing attention to the increasing number of visitors from Belarus to Turkey, President Erdoğan stressed that a visa-free travel opportunity has led to a gradual rise in the number of Belarusian tourists. "In 2016, a total of 113,000 visitors from Belarus to Turkey came while the number jumped to 245,000 last year," the president noted. Belarusian President Lukashenko underscored that there is no issue on which Turkey and Belarus cannot agree on, praising growing bilateral ties. "Turkey and Belarus share the same stance on every matter," Lukashenko said and continued, "Economic relations should constitute the foundation of our good relations." 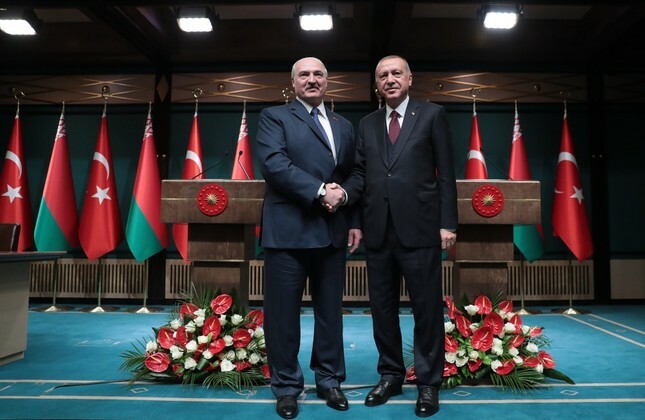 Lukashenko recalled that Turkey is the first country to recognize the independence of Belarus in 1992 and stressed that bilateral relations have gained new momentum after President Erdoğan's visit in 2016. President Erdoğan also expressed Turkey's gratitude to Belarus for its contribution to Ankara's fight against the Gülenist Terror Group (FETÖ), which orchestrated the July 15 coup attempt. Erdoğan noted that Belarus never hesitated to take the necessary steps and shut down all FETÖ-affiliated associations and foundations. Turkish contractors are ready to carry out all kinds of construction projects in Belarus, the country's agriculture and forestry minister said yesterday. Remarks by Bekir Pakdemirli came during a Turkey-Belarus Business Forum in the Turkish capital Ankara which followed a two-day convention of the Turkey-Belarus Joint Economic Commission. Pakdemirli said mineral fuel oil, chemicals, cosmetics, cleaning equipment, construction products, automotive and heavy machinery industry were potential sectors for investment. Deputy Prime Minister of the Republic of Belarus Igor Lyashenko stated that Turkish and Belarusian leaders are resolute on boosting trade and investment volume, adding that they could allocate space for Turkish investors in Belarusian industrial zones with special locations and privileges. The Turkey-Belarus Business Forum held in Ankara was attended by Belarusian Deputy Prime Minister Igor Lyashenko, Turkish Agriculture and Forestry Minister Bekir Pakdemirli and representatives of the business communities from both countries. Speaking at the opening of the forum, Lyashenko called on the business community representatives of the two countries to be more active and pointed out that 143 Turkish companies are operating in Belarus currently. Remarking that Turkish investments in Belarus have amounted to nearly $1 billion, Lyashenko said that they export products such as chemical, textiles and fertilizer to Turkey. Stressing that the leaders of both countries are willing to increase trade and investment volume, Lyashenko stated, "As such, we have to diversify sectors and areas [in trade and investments.]" Pointing out that Belarus has convenient and advantageous opportunities for foreign investors, Lyashenko remarked that audit firms have positively rated this favorable investment environment. The Belarusian deputy prime minister also said that Turkey is also ready for foreign investors likewise, continuing that the existing cooperation potential between the two countries in relation to logistics and transportation must be deepened. Lyashenko emphasized that they are open to cooperation with Turkey in the fields of innovation and technology, adding that they anticipate collaborative work regarding informatics. The Belarusian deputy prime minister concluded that they could carry out their research and development (R&D) activities in order to increase energy efficiency in engineering vehicle production with relevant Turkish companies.